For the discerning lover of modern Hawaiiana. It is my pleasure to bring you this beautiful vertical print shirt. Stunning Brugmansias or Angel Trumpet. Dominant colors are black and gold. 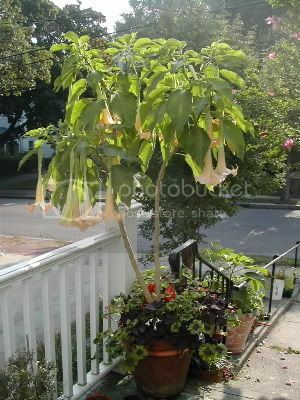 Brugmansias or Angel Trumpet plant. Image from mimikirchner dot com blog. Condition: Worn only once, if that. No signs of wear. Fabric 55% cotton, 45% rayon. From shoulder to hemline 29"
Items are from a non smoking environment. We love our international clients, please email with country of shipping for quote and we will send you an Invoice with the total including shipping. Please note that we never charge handling fees, actual shipping only.